Roger Stone is such a craven sociopath when it comes to politics, he viciously attacks people just for fun. He attacks his own friends the minute they get hauled before the grand jury to testify against him. He makes things up about reporters who cover his scandals. He’s publicly attacked me on three occasions, and I’m not that important. So now that we’ve learned Michael Flynn has sold out everyone in Donald Trump’s orbit, you’d think Stone would let loose on Flynn. Instead we saw something very different. Roger Stone simply sent a snippet to the mainstream media, heaping praise on Michael Flynn, and insisting that Flynn wouldn’t have been in position to give up anything important about Donald Trump. This is just weird. We’ve already explored why Donald Trump doesn’t feel he can publicly lash out at Flynn, but why would that stop Stone from doing so? To be clear, Roger Stone hasn’t suddenly gone soft across the board. Thus far today he’s used his infamous Instagram account to launch deeply personal attacks against Joe Biden and a Wall Street Journal reporter. But in the unique case of Michael Flynn, Stone is following Trump’s lead. In fact Stone is taking it even further by praising Flynn, at a time when Trump is content to simply not mention Flynn at all. So what gives? The big hint here is that earlier in the week, Donald Trump publicly praised Roger Stone for not testifying against him, and Stone responded by publicly thanking Trump for that praise. Stone seems to think his only way out of this is to stay on Trump’s good side, which for the record is weird, considering that strategy hasn’t worked out well for anyone else (see Paul Manafort). 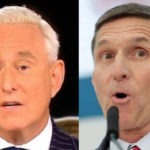 Roger Stone’s refusal to attack Michael Flynn suggests that he’s truly afraid Flynn will take Trump down, rendering Trump unable to magically get Stone off the hook. But Flynn has already turned over all the evidence and testimony he had to give. It’s not as if kissing up to Flynn is going to do Stone any good at this point. Stone’s behavior is increasingly coming off like someone who doesn’t see a way out, and is simply flailing.